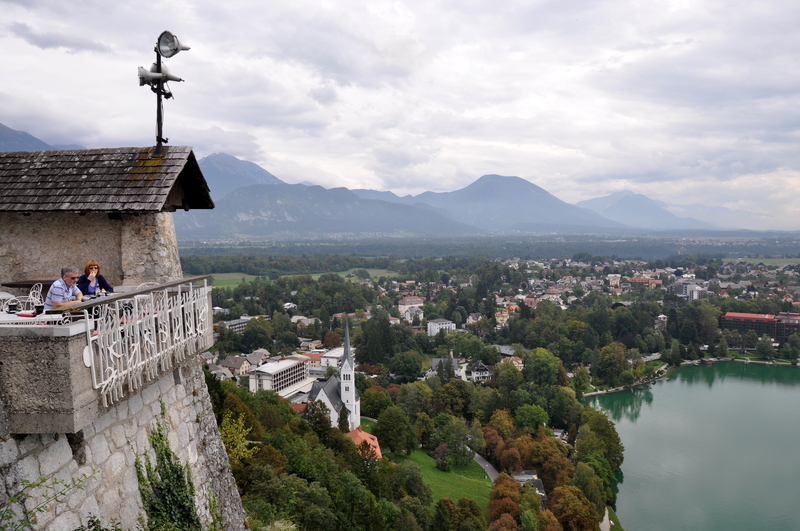 The European Alps, that tiny slice of Central Europe where Germany, Switzerland, Austria, Liechtenstein, Italy, and Slovenia meet up, is arguably the most picturesque landmass on the continent. Snow-capped peaks tower over rolling pastures that, in turn, back up to peaceful villages with thatched-roof houses and wooden bridges over mountain-fed streams that flow into green sub-alpine lakes. In the summer, mornings are cool, afternoons are sunny, and evenings are lazy. In the winter, lakes freeze over, snow drifts pile up against farm tractors, and ski runs open for business! There are dozens of charming towns and villages competing for your hard-earned tourist dollars. 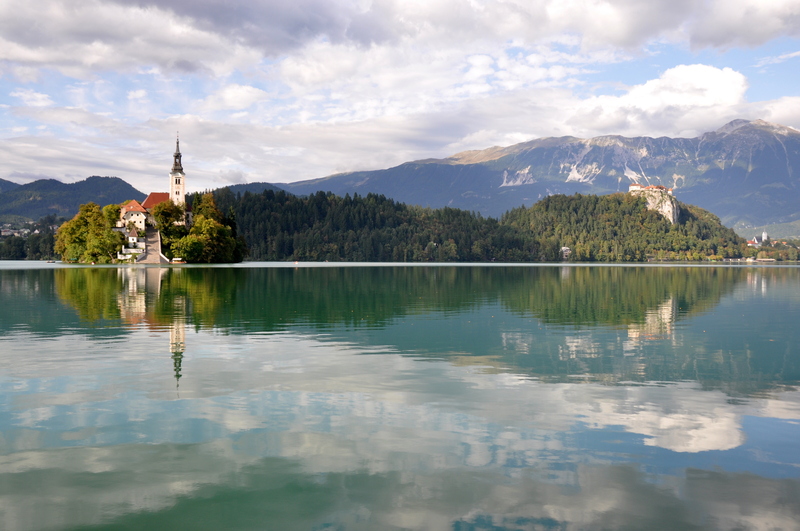 If you can manage to leave busy Switzerland, Germany, and Austria for quieter, less expensive Slovenia, you may find that Lake Bled, a lake and town that you may have never heard of before reading this post, offers as much bang for your buck as Zermatt, Garmisch-Partenkirchen, and Innsbruck. 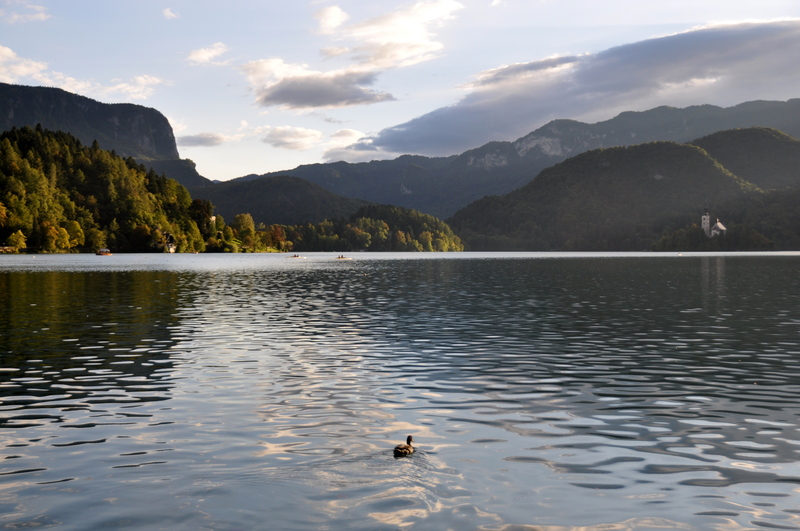 In Lake Bled, the spectacular Julian Alps surround one of Europe’s cleanest lakes. The lake’s drawcard: an island with a church on it, and a hilltop castle standing guard over the island, lake, and surrounding countryside. 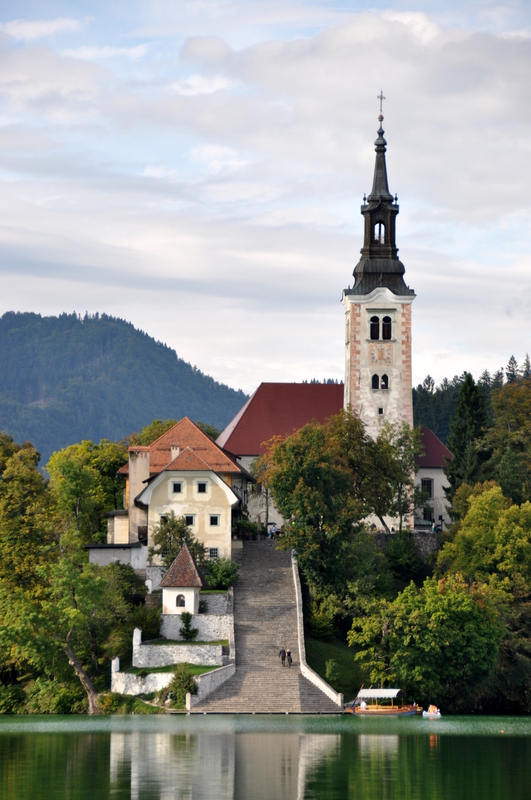 Blejski Grad – Bled Castle – as seen from below. 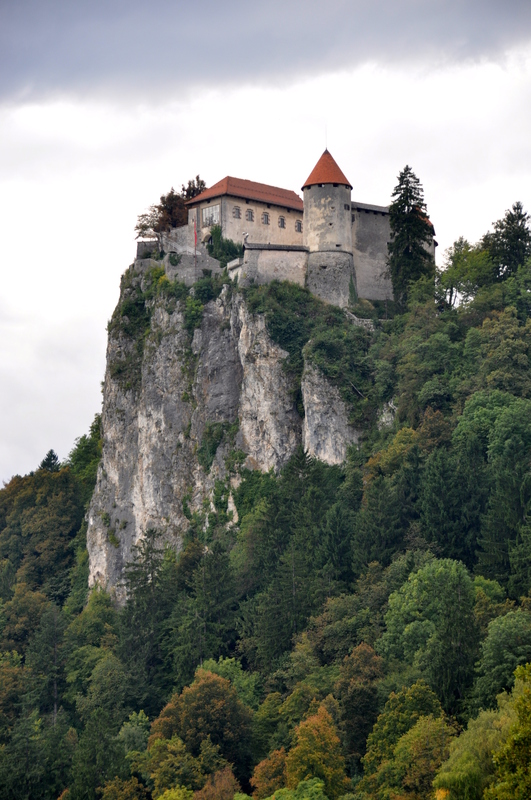 It is worth the trek to the castle itself, which offers panoramic views and the requisite galleries. Have a glass of wine and enjoy the view! 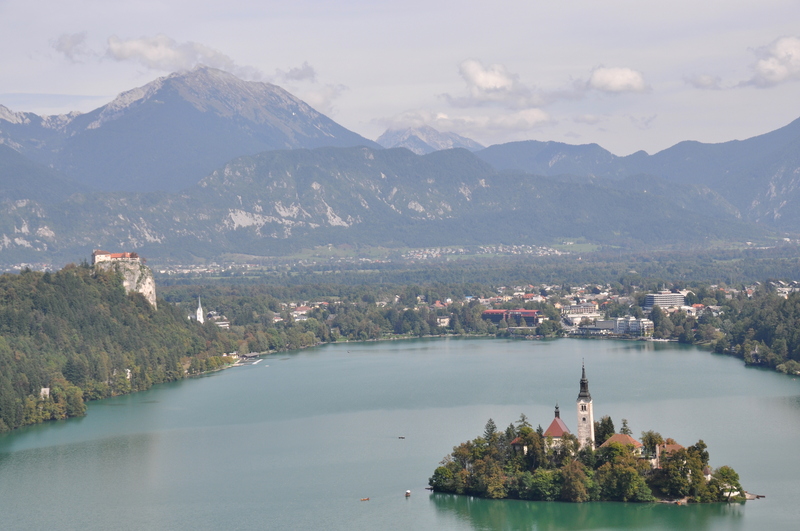 If you wish to go even higher, the back side of Lake Bled offers a variety of hikes to various vista points. 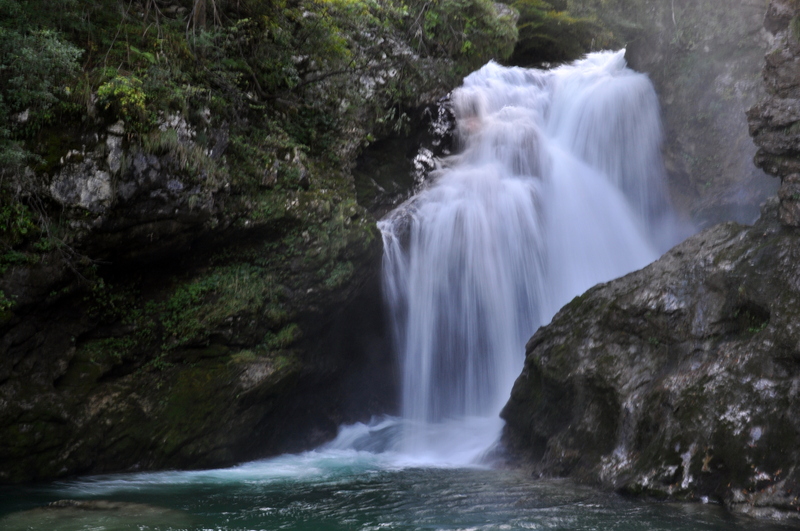 The photo above was taken from Velika Osojnica, a short, steep hike that includes wooden ladders and ropes for assistance getting up and down its precipitous slopes. Want to set foot on the island itself? At least three different places along the lakeshore offer rowboat rentals. I don’t recall the price except to say that it is per hour, and reasonable. 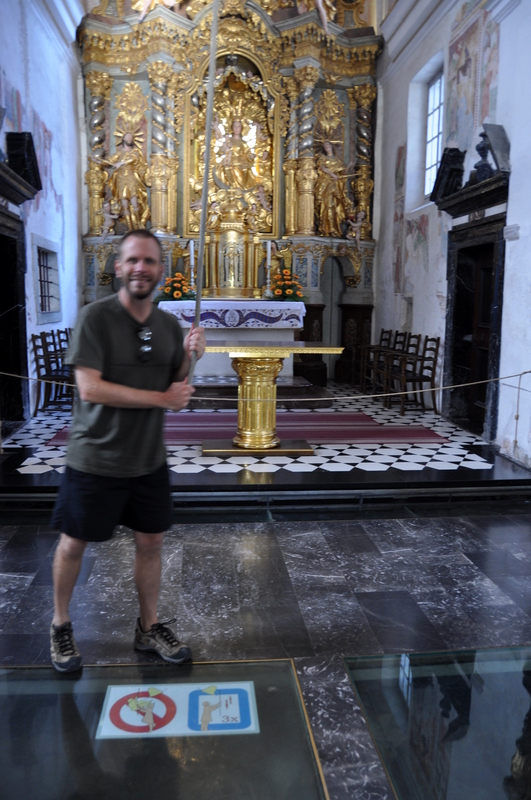 Those stairs lead to the Church of the Assumption, which has a gold altar and otherwise austere interior. The view continually changes as you walk around the lake and as the sun and clouds do their strange dance. In a word: serene. 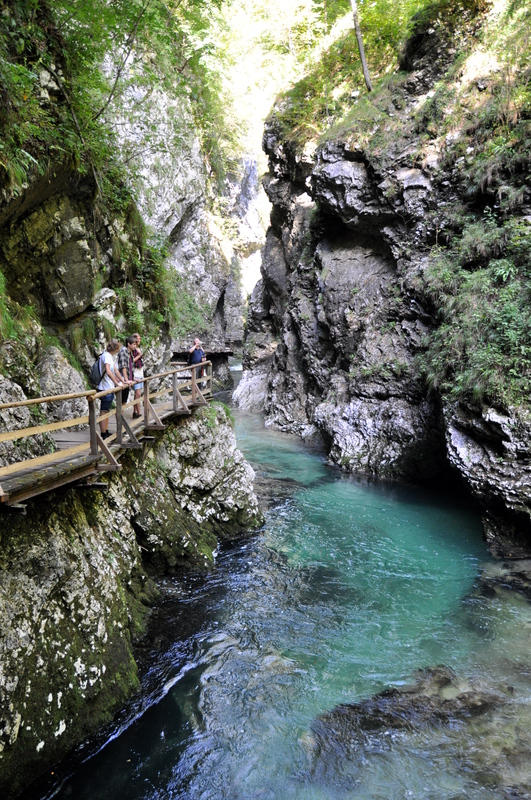 A pleasant walk out of town leads to Vintgar Gorge, where the water is blue, not green, and narrows as it flows between the rock walls pictured above. …and one natural. 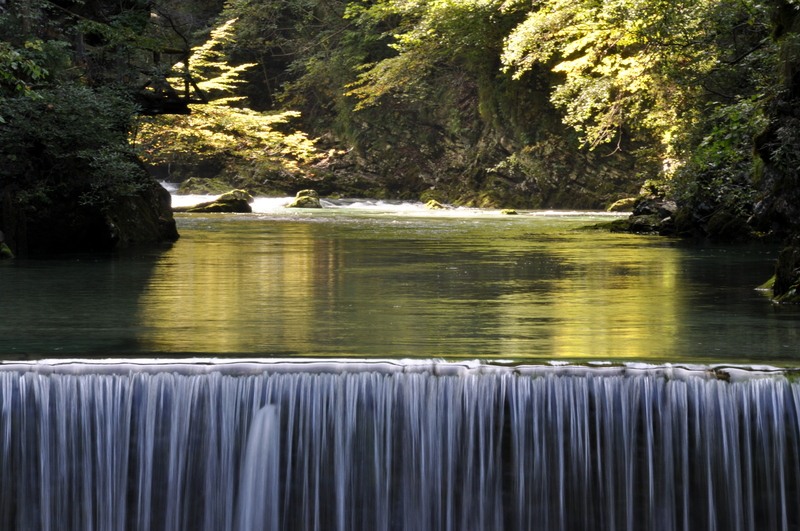 Trout is fished from the gorge and served to diners at the restaurant near the entrance. 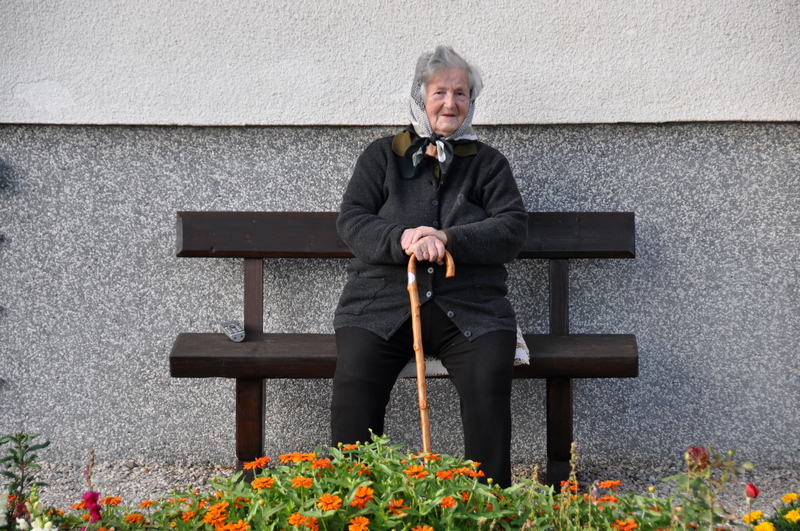 I took a different route back to town, and passed a few villagers, such as this friendly Hausfrau. The only thing that would have made this picture better was seeing a few cows in the background. 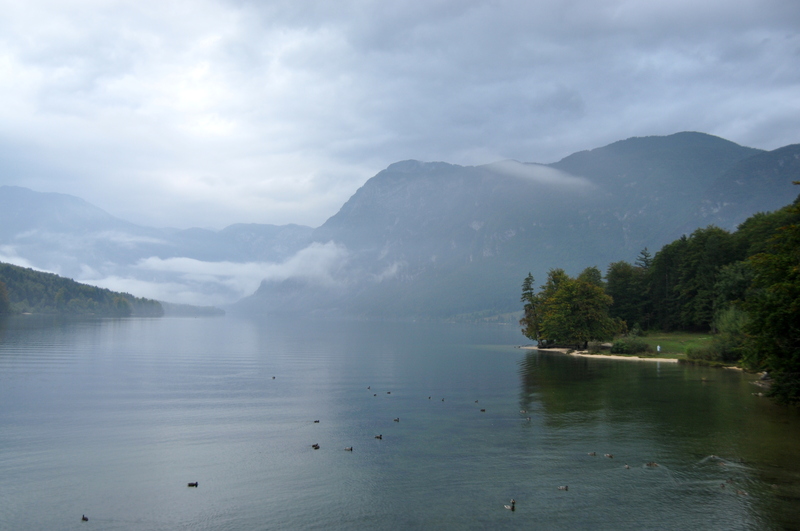 Perhaps 40 minutes outside of Lake Bled by bus, Lake Bohinj is an even more pristine lake, home to just a few hotels and restaurants. 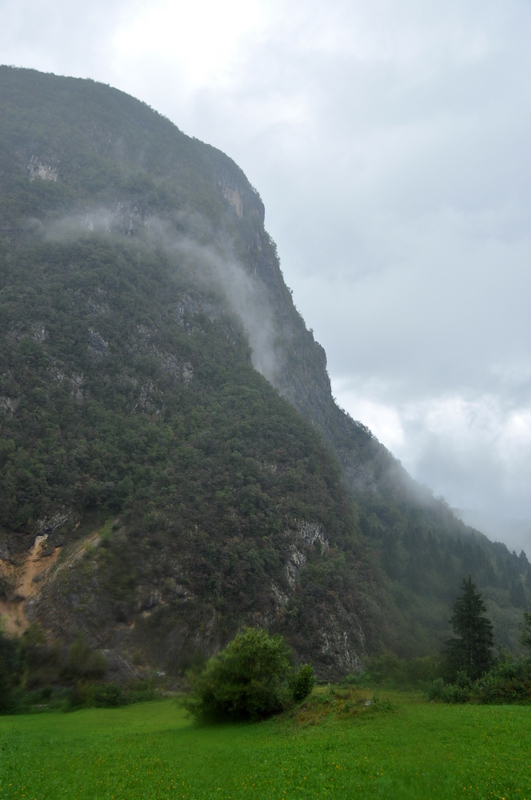 It started raining the moment I arrived in Bohinj and didn’t stop for four days. The weather put a halt on my plans to summit Triglav Mountain, the highest peak in Slovenia at 2,864 meters/9,395 feet. Still, the image above is one of my favorite captures. 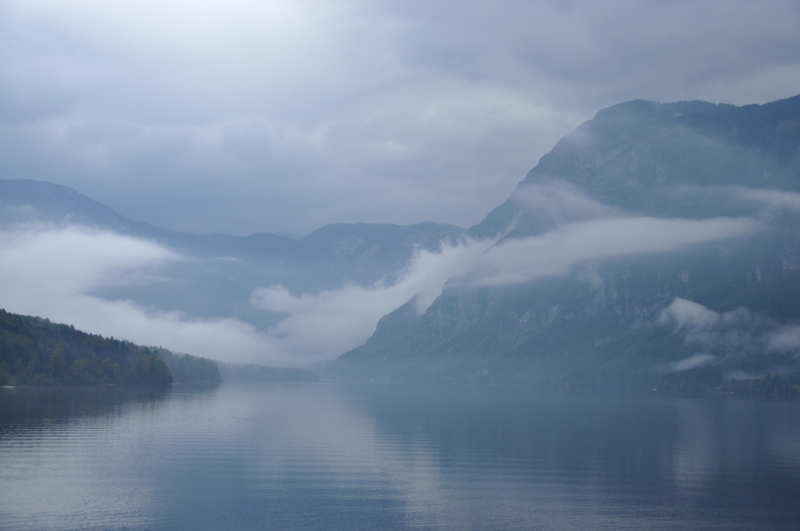 I visited Bled and Bohinj in late September, and the weather change from one place to the next clearly marked the passage from summer to fall. 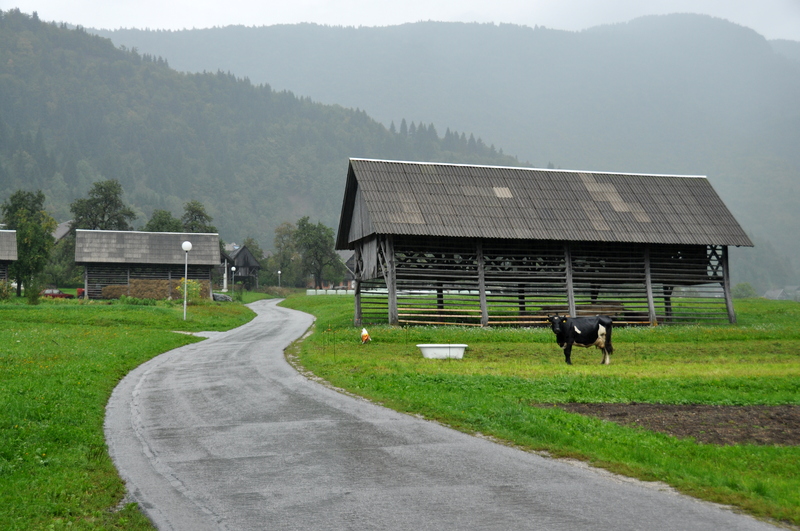 Villages near Bohinj celebrate this change in seasons with a festival that was unfortunately canceled because of the rain. 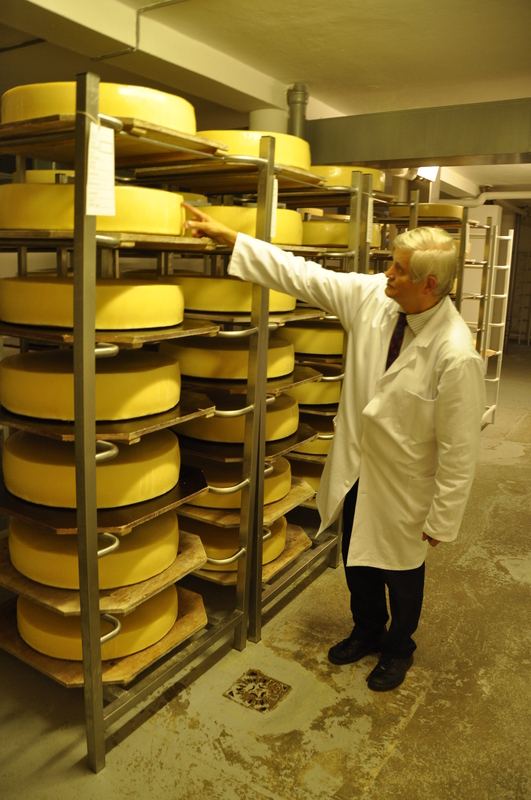 One thing that was running, however, was a tour of a local cheese factory. 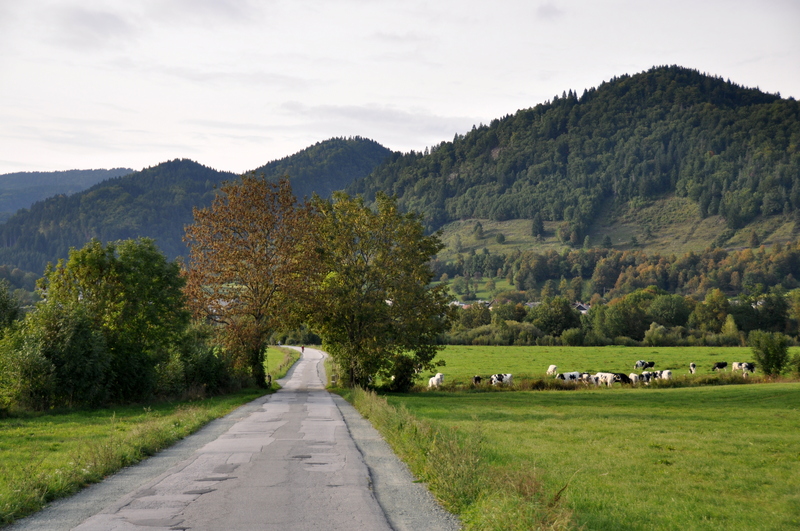 Another two months from now, the road pictured above would be impassable. Winter arrives early in the mountains, and lingers long. 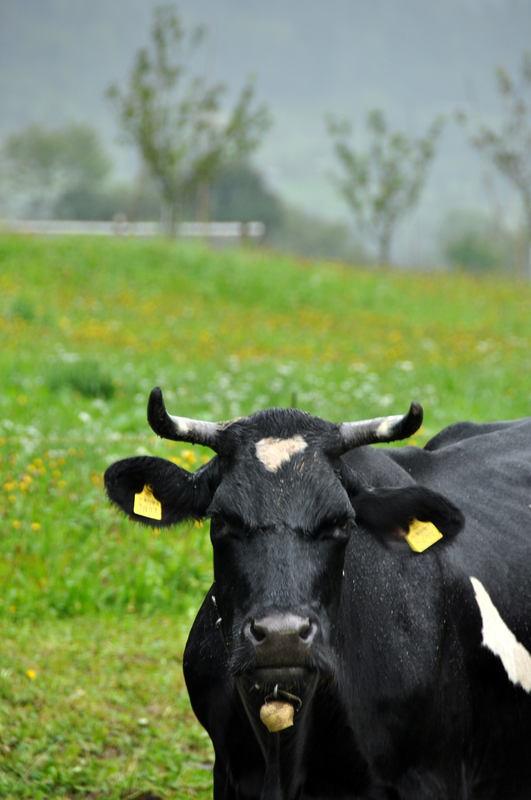 This cow is not happy about the rain, about the end of summer, about his ear tags, about some gringo taking his picture. He is having none of it. Even with the rain, these cliffs reminded me of the karst hills of Guilin, China…and of El Capitan in California’s Yosemite National Park. By the time I got back to town, the rain had flooded this dockside picnic area, and I knew that it was time for me to move on to sunnier climes. But what can you do? 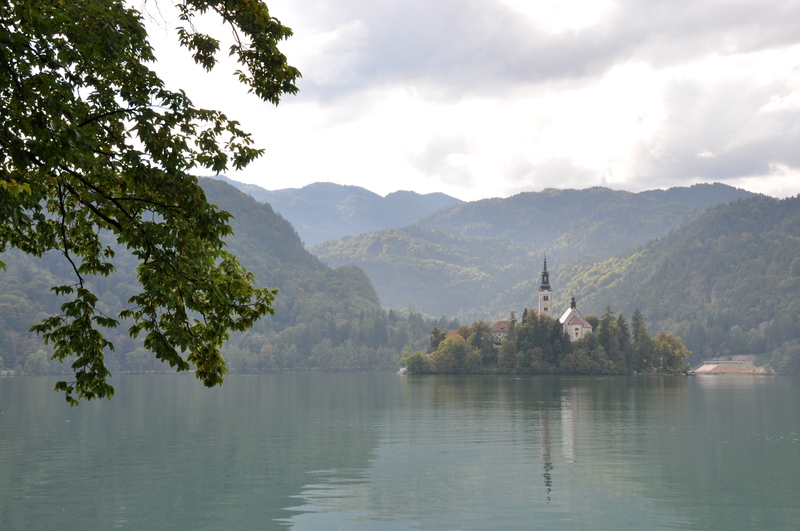 It has been seven years this month since I visited Slovenia, but despite all of life’s strange journey in the time that has passed, I have never gotten memories of Lake Bled, and the spell it cast upon me, out of my head. This is why I travel. Beautiful pictures and a nice description. There are so many gorgeous and fascinating places in the world to see. I pity those who either can not or do not wish to travel. Agreed. I have been luckier than most in terms of having be able to visit so many places. 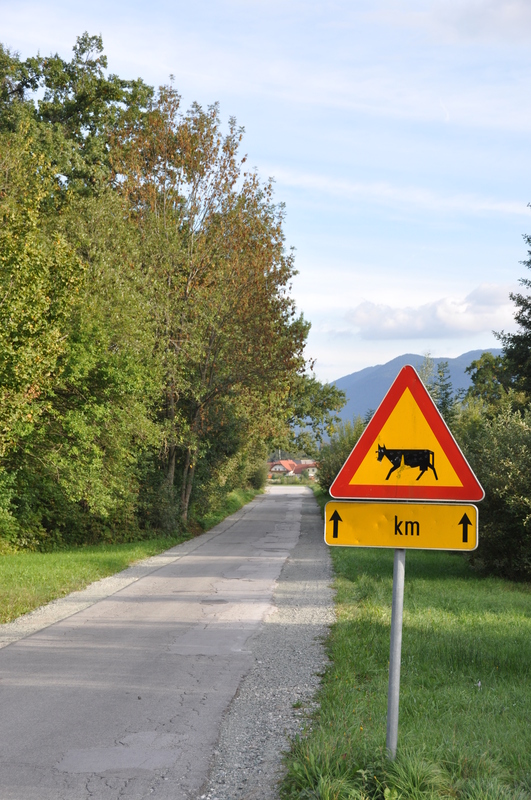 Slovenia is high on my “favorites” list for sure.